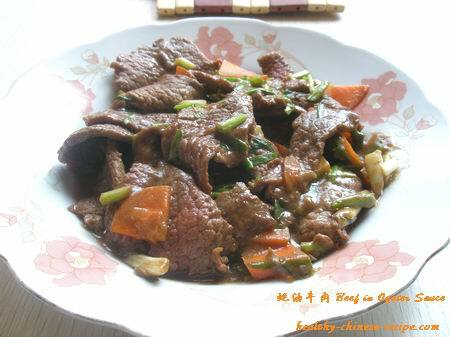 Beef in Oyster Sauce is originated from Guangzhou. The first person who made this dish is the founder of Lee Kum Kee. Most oyster sauce dishes are invented by Cantonese chefs. They are good at making use of oyster sauce in their food. Beef oyster is a stir fry dish with fresh and salty flavor. Combining the fragrance of beef and the freshness of oyster sauce, the dish tastes tender, smooth, and delicious. The key points of this dish is to choose tender beef and well control the stir fry time. Beef tenderloin is the best. Benefit of the dish: Nourishes stomach and spleen, strengthens our bone, and supplements blood. Suitable for those who are weak, short of breath; or those who are with anemia or chronic conditions. Diet restriction: Eating too much beef may cause food stagnation. Less 100g each time for an adult is better. 1. Cut beef into thin diamond flakes. Mix in Marinade sauce by this order: rice wine, soy sauce, cornstarch, and olive oil. Mix oil last. Put in a fridge and marinate for 15 to 30 minutes. 2. Heat oil in a wok, slip in beef flakes. Stir fry till the beef almost changes to white color, about 10 seconds. 3. Add Seasoning A, stir fry several times(5 to 10 seconds). 4. Pour in Sauce A, quickly stir fry till thicken and well coated. 5. Arrange in a plate, serve. 1. Slip in beef when the cooking oil haven't been fully heated (30% heated). This will keep beef tender. 2. Beef in oyster sauce is actually a quick stir fry dish. Each step should be very fast, otherwise the beef may be over cooked. 3. More professional cooking way is that, pour out the beef at step 2,then put back at step 4. The beef will be more tender as it stay shorter in the wok. 4. Stir fry dishes are more delicious in small portion. 5. It's easy to cut into thin flakes when the beef is frozen and then half melt. Remember cut beef across the grain.